Editor's Note: Rebecca Hiltz ’16 received the 2016 Hamel Traveling Fellowship. Here, she shares the story of her experiences in Germany living and working on a family farm. My time in northern Germany was a life-changing trip that allowed me many new experiences. By visiting a range of cities, museums and universities, I was able to immerse myself in the history and language around me. There is no better way to learn a language than to navigate and speak on your own! I am happy to say that I am now conversational in German after two months of living in Germany. My host family treated me as one of their own: I attended rowing practices, soccer games, family birthday parties and the town's Easter Fire celebration, among other events. 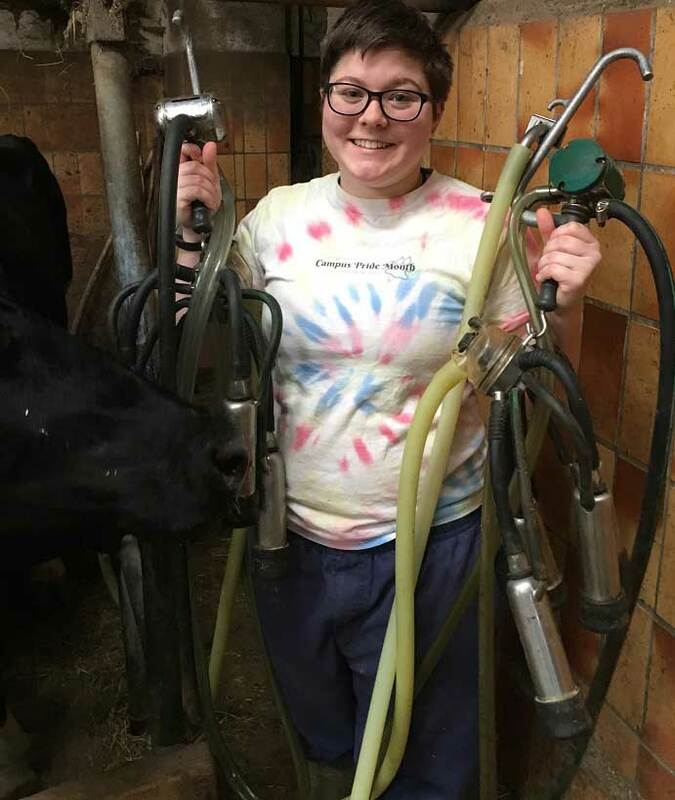 I also became a part of the daily ebb and flow of work that is involved in running a small dairy farm. Though I have worked on family farms in the U.S., and though the work of shoveling and feeding and milking is much the same, I found that these small-town German farmers have a slower outlook and a strong dedication to their livestock. Karin, my host Grandma, said something to me one morning that I will not forget: "If your cows are fed by a machine, milked by a robot and are anxious or fearful when you come into the barn, then those are not your cows." A woman who is quick to smile and even quicker to laugh, Karin could often be seen stopping to spend a moment with an individual cow or to tell the other workers and me a story. "A cow who does not know its own people is just a machine," she said. "An animal that is loved and calmed by your presence is truly yours." Most of the work on the farm is done by hand, which I took to be rudimentary and tedious at first. But after a few weeks, I began to see that slowing down and doing things by hand can be an advantage on a small farm such as this one. When a cow was sick, Karin and her husband Hartwig knew right away. Even with over a hundred cows, calves and heifers, they were able to give animals individual attention as needed. The U.S. Holstein cows may have originated in northern Germany, but today the Germans use U.S. or Canadian bulls for breeding. This fact alone made me realize how connected we are to each other — Germans impacted our dairy industry with the Holstein, and now we are impacting their history. Genetics aside, these farmers hold on to very old ways of thinking and farming that could seem like a step back from our modern, fast-paced world. However, I have discovered that we can always learn from our past, even if it is just to slow down, pay attention and to truly get to know your animals. One day in the future when I am working on some big U.S. farm, I will think back to Karin's words, pat some cow noses and let this old bit of history repeat itself.